Although the iPad is still the dominant force in tablets, its chief rivals see plenty of room for competition. Nick DiCarlo, VP of product planning for Samsung Mobile, noted that the market has shown that, despite Apple’s pronouncements, there is a demand for a range of tablets, including smaller, 7-inch models. DiCarlo also noted that the company knows how to quickly come from behind. It wasn’t that long ago that his company had only a tiny part of the phone market and it is now a serious player. He said he sees the same thing happening in the tablet space. 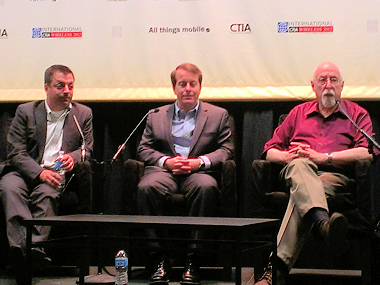 “I think it is very, very early days,” DiCarlo said in a CTIA panel moderated by AllThingsD co-Executive Editor Walt Mossberg. Taking aim at his main rival, Jamie Iannone, president of digital products for Barnes & Noble, said that the Nook Tablet clearly outshines the Kindle Fire in a head-to-head comparison. Iannone noted that its color tablet is a second-generation product designed specifically for reading, while Amazon used another manufacturer’s design. “As you know, the Fire was built off a reference-design product to get it out quickly,” Iannone said, adding that the product suffered as a result. As for Apple, Iannone noted that many iPad owners also have one of its E-Ink Nook devices because the iPad isn’t ideal for long-form reading.